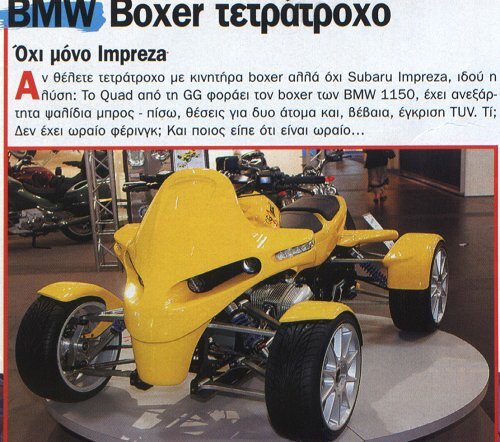 Says "MOTO" Magazine: BMW Boxer fourwheeler. Based on the R-series boxer motor, David Robb's design team made this prototype which could easily roll into production.The front of the bike has dual headlights which fit into a shell that borrows from the CS stying, while special attention has been payed to the finishing details of every metal parts, from engine to telelever parts. It looks good in black and grey while the engline looks smaller than it is. The single seat is a bit confusing to us, since this kind of motorcycle are beeing seen rolling two-up quite a lot, especially in city. Barcode: It can be made with engine sizes from 850 to 1200. We prefer the 1200! Can be made without ABS and EVO. How: With the colors and the signature of Mamola. BMW added an "easy" model to its lineup. It's the Replica of the International BoxerCup, which is being done with R1100S models. 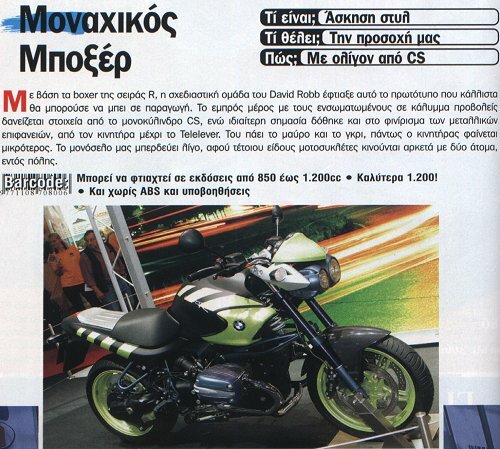 It strikes the eye right away from normal R1100S's thanks to its color scheme. Furthermore, it's got a plastic lower fairing, bearing the stickers of all the Cup sponsors, different cylinder head covers, a 5.5in rear wheel with a 180-section tire, and it sits a little higher, thanks to longer spring spacers in the suspension. It can be bought with all the optional parts for the S, like ABS, saddlebags etc. It's got the new and improved for 2003 gearbox. All the money is in the signature of Randy Mamola on the fueltank, however! Barcode: 98HP, 229kg, extraordinary color-scheme, you can order her without the sponsor stickers.